IF YOU LIKE IT….PLEASE SHARE THE MUSIC AND THIS PAGE. This whole project was financed by almost 7,000 supporters at patreon. More on that below…but THANK YOU to ALL the PATRONS. Your money made this happen. listen/purchase on Spotify, iTunes, Apple Music, TIDAL, Google Play, and Amazon! I was talking on the phone to Jherek the next day talking about our arrangement for “machete”, the song we’d just tracked in LA. Bowie meant so much to both of us, growing up. and i knew that if we didn’t do this NOW, we’d say it was a good idea and then find a million reasons not to get around to it. We gave ourselves a deadline of two weeks. We made it. Jherek put the petal to the metal, arranged a song a day, recorded his A-list string quartet in L.A. in 3.5 hours, then I spent two straight days in the studio doing vocals. It was the longest time yet i’d been away from the baby. My mom took care of him one day, a babysitter the next, and Neil took the night shifts. I’m back at work. It feels right. 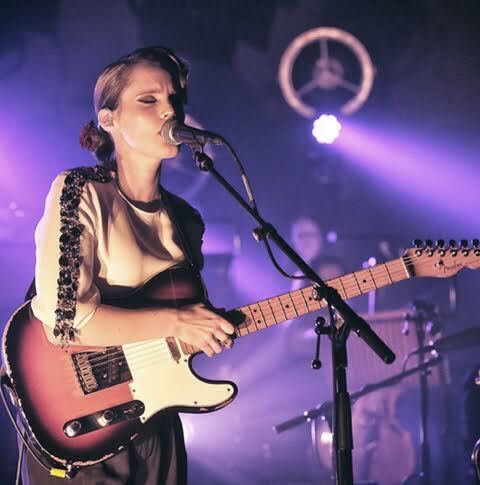 We invited UK indie guitarist/vocalist Anna Calvi to play and sing on “Blackstar”…. photo by Nick Pomeroy from Anna’s official instagram feed. WHO RECORDED HIS VOCALS ON IPHONE…. ….and, finally, Neil did the countdown for “Space Oddity”. Do you really need a picture of Neil? Here he is doing his Adam Driver impression. 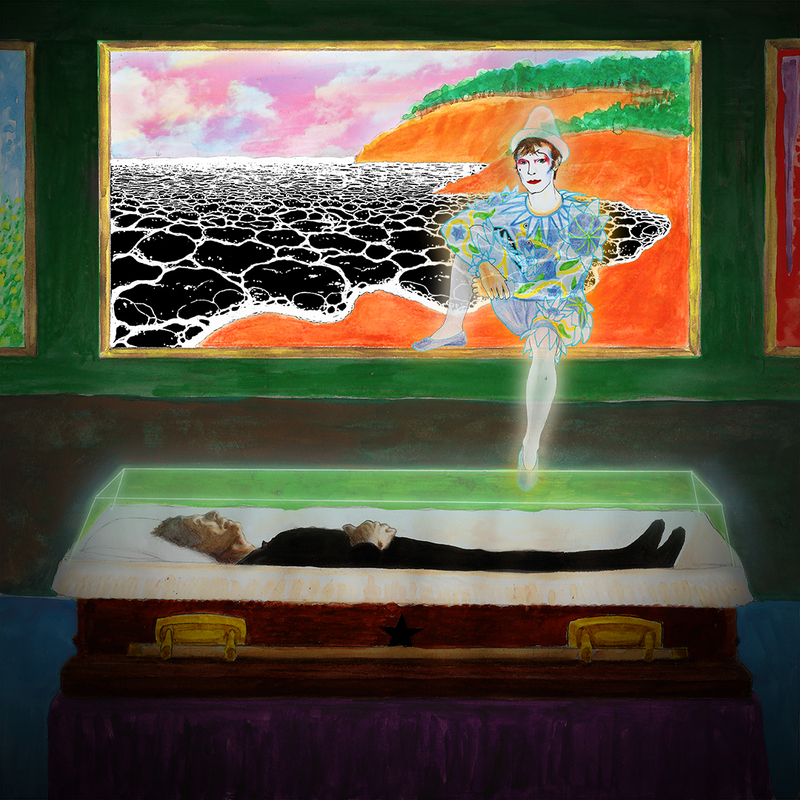 Then…we emailed a ton of artist friends and they all contributed Bowie-and-song inspired artwork. It felt like a truly fitting family tribute. 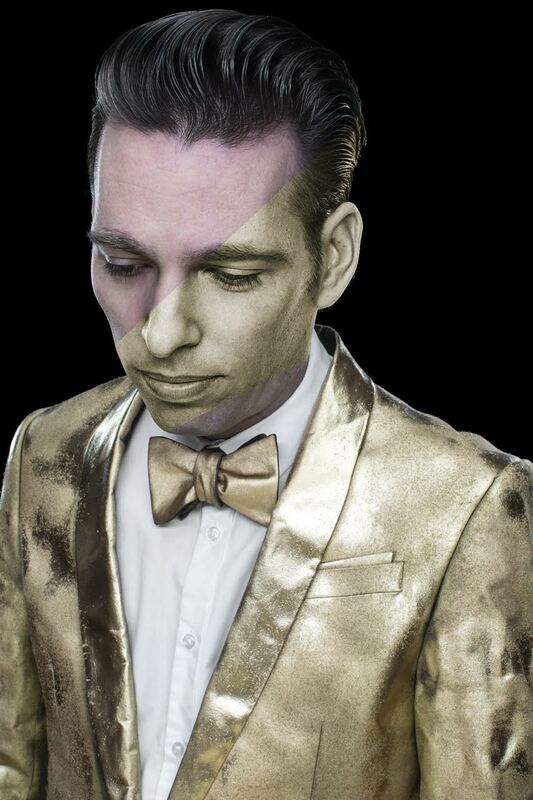 Jherek slaved on the mixes and I listened to them on the go…in the car, on headphones while breastfeeding, in the bathrooms of people’s houses. 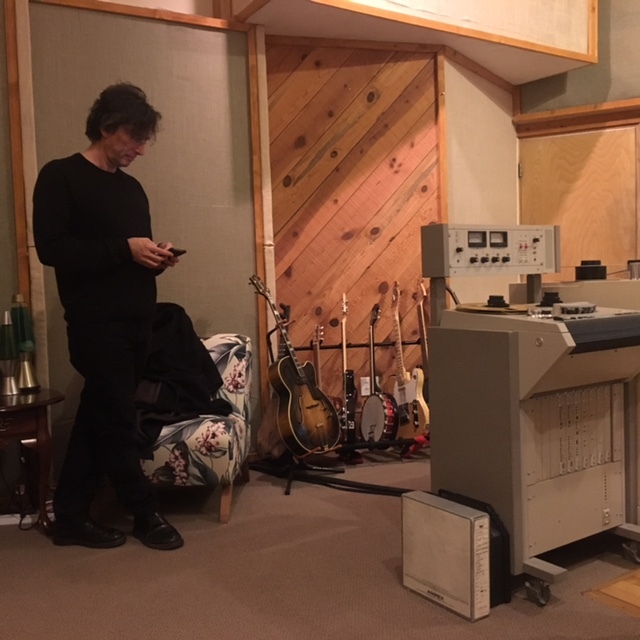 here i am in the studio with my engineer Jono Manson…. We’re really, really, really proud of what we made, even though we cranked it out in a short time. It didn’t hit me until a week later, in the studio, why this was such a fitting project. 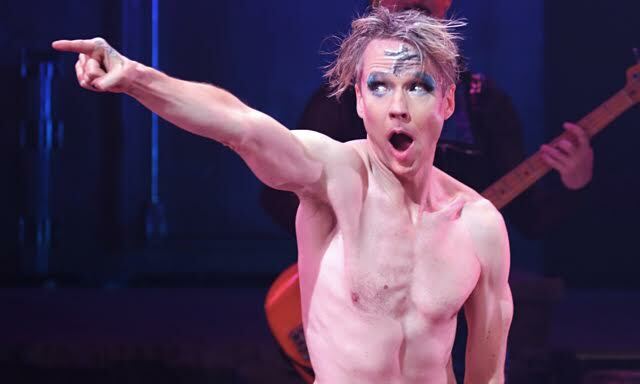 We were immersing ourselves in Bowieland, living in the songs, super-glueing up some fresh wounds. Not just “knowing” the songs, but feeling the physical chords under our sad fingers, excavating the deeper architecture of the songwriting (especially with a tune as bizarre as “Blackstar” (which we realized was constructed like a sonic Russian nesting doll). and now, a word about the patreon, which made this all possible…. the patrons covered the artists, babysitting, studio costs, strings, the web team, all the guest appearances….you name it. We would not have been able to work this fast and put this project out without this funding. All the $3+ patrons will get the tracks emailed to them. 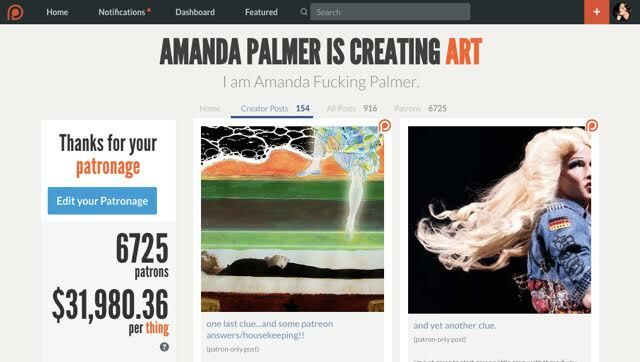 THIS IS THE WEIRDNESS PATREON MAKES POSSIBLE….a budget with which to just GET TO WORK. PLEASE CONSIDER JOINING TO HELP US MAKE MORE RANDOM BEAUTIFUL THINGS! 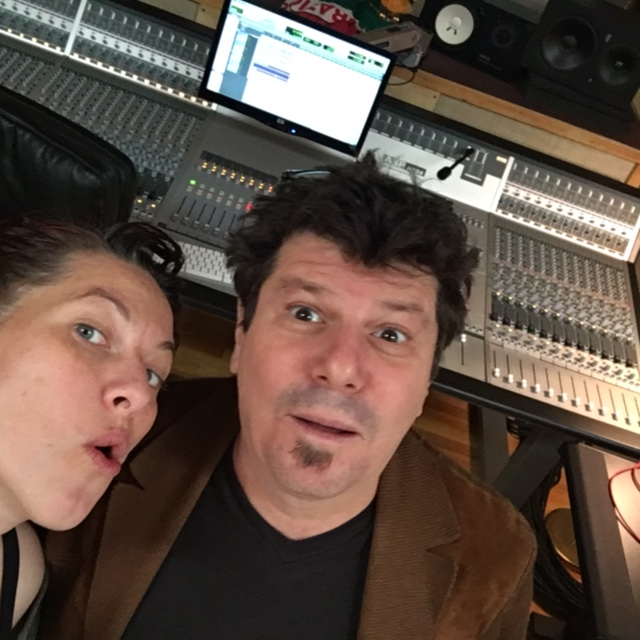 I recorded vocals in Santa Fe, NM, at The Kitchen Sink, engineered by Jono Manson. Jono added the acoustic guitar on “Space Oddity”. The artwork was created by artists from three continents. We’ll be posting their stories over the next few days for the patrons, then depositing them here. 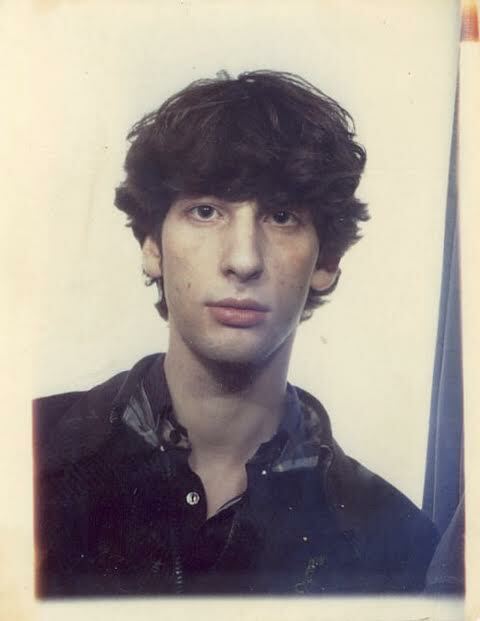 writer, teacher, box office employee, band mate and roommate based out of Boston. I woke up in the middle of the night and saw the text that Bowie had died. There was a kaliedascope of images, sounds, voices, musics icons, of him going through my mind. I realized that I wasn’t going to sleep. I knew I would have to get up and make a painting of Bowie to help process this. 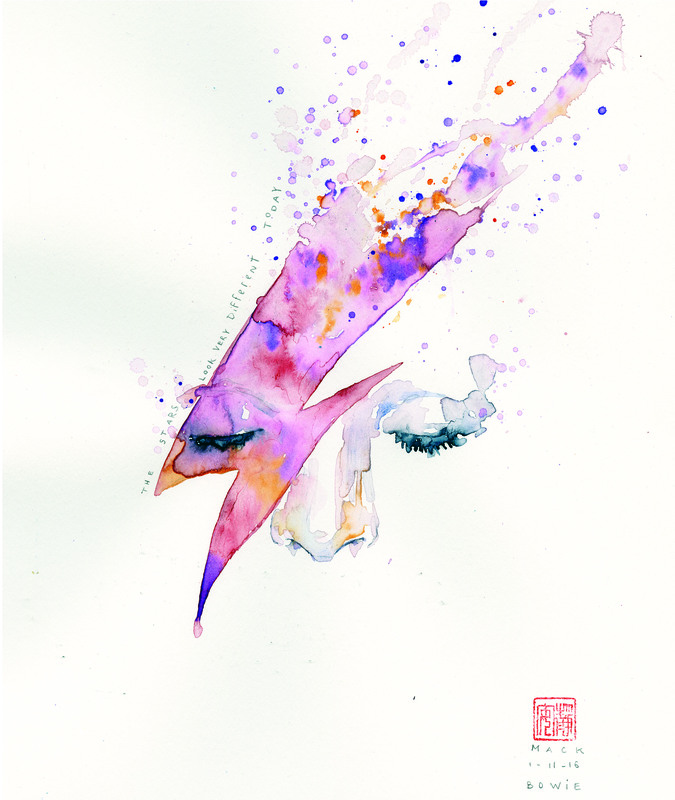 I got right up… somewhere between sleep and wake… and started making Bowie paintings. I’ve always connected to Bowie’s music and continual evolution in his art and expression. It connects from the heart and the mind. There is a layered texture of the visual and the audio… something that you immediately zero in on… but something else that keeps making you think about what is below the surface. Its immediately striking… but it also makes you ask questions. Makes you think about it. Makes you try to wrap your head around something. It forces you out of your comfort zone, and makes you widen your mind with the effort. The entire continum of his works have a rythm. As an artist, as a writer, as a performor, I felt like Bowie was organically cycling through his wheel of life of incarnations… each era, each project a birth, a life, an era, and then a reincarnation to the next. 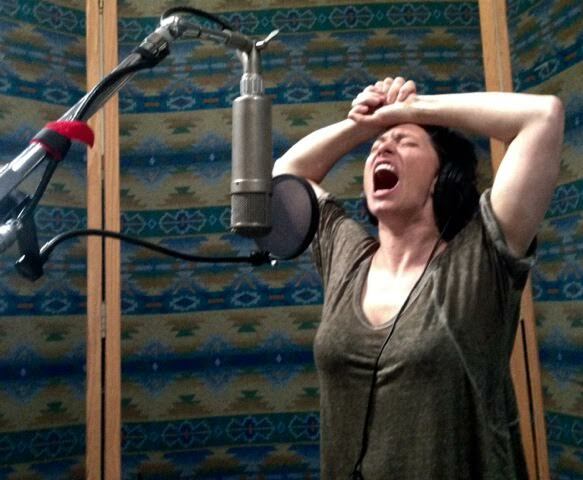 To be able to do this over and over is pure joy for an artist. Each foray then because part of the continuum of the whole… something to be built on top of, or contrasted, or a nod to an earlier work or version of self referenced from an newer one, but now in a different context. 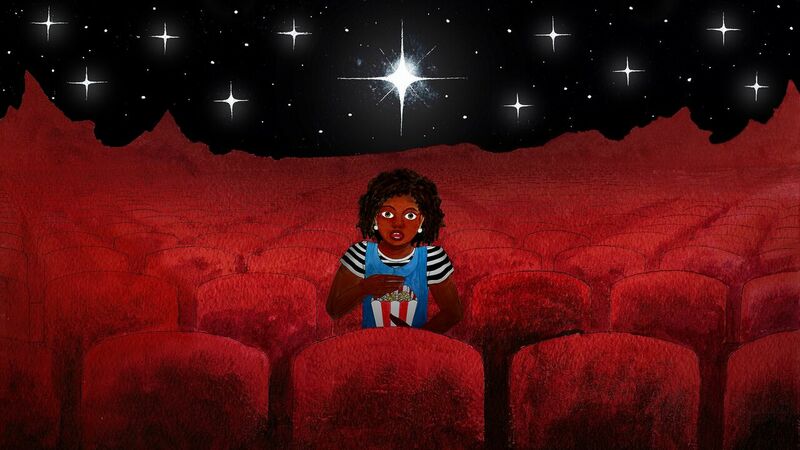 While I paint the piece, the line “The stars look very different today” sings inside me. Bowie understood metaphor. He understood re-contextualizing. Bowie was able to write metaphorically… but then he was able to BE the metaphor. And just when you thought you understood the metaphor… he was fine with turning himself into the next metaphor. Bowie became his own kind of literary device. He became his own art instrument. He embodied his own theater. He kept an open mind to all the things that caught his eye… and then you let them into his laboratory, his playground, his work, and he recontextualized them… through his own lens. And offered you a view. I think of the Phoenix. Rising from one metaphor to the next. 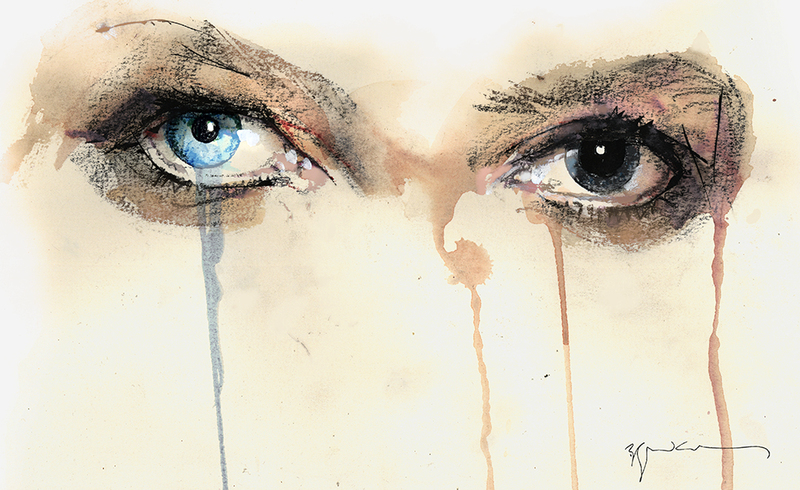 David Mack is the New York Times Best Selling author and artist of the KABUKI Graphic Novels, cover artist for FIGHT CLUB by Chuck Palahniuk, the writer and artist of Daredevil from Marvel Comics. Mack created artwork for the opening titles of the new Jessica Jones Netflix TV series. For the #1 hit film Captain America The Winter Soldier, Mack created the art & concept for the credit/titles sequence with Sarofsky Desgin. Mack’s work has garnered nominations for seven Eisner Awards, four International Eagle Awards, and both the Harvey and Kirby Awards in the category of Best New Talent. uniqueness, and looking at his incredible costumes and personas through the years gave me the confidence to wear whatever the hell I wanted and was a huge influence on my crazy style. The V&A exhibit in London was worth travelling 24hours from Australia for, and I was moved to tears upon seeing the handwritten lyrics to Rock n Roll Suicide. He has entered my art on numerous occasions, via dreams and babies and sexually suggestive poses. 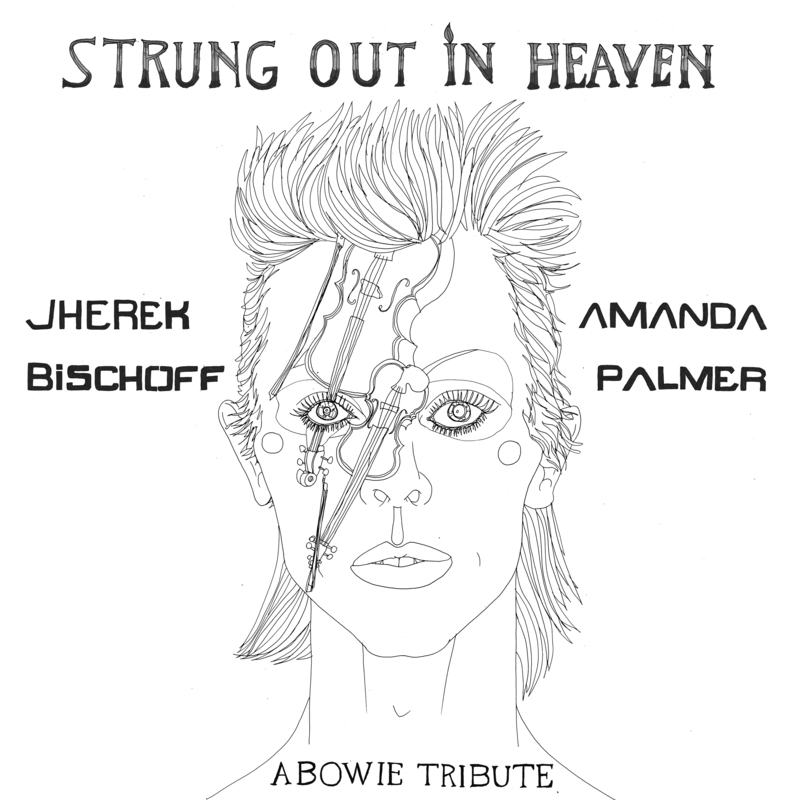 So when Amanda asked if I would create something for a tribute record she was working on, I jumped. All my life I have been obsessed with Space – NASA launched the shuttle program 12 days after I was born, and I grew up in an era when teachers were being sent up to conduct lessons in zero gravity. So Space Oddity resonated with me in my teens from the moment I first watched the music video on a 90s Britpop show, sandwiched between Pulp and Blur. Last year, I even went to Space Camp in Huntsville, Alabama, where I learned to pilot the space shuttle, commanded mission control, and performed an EVA (extra vehicular activity) in full spacesuit. 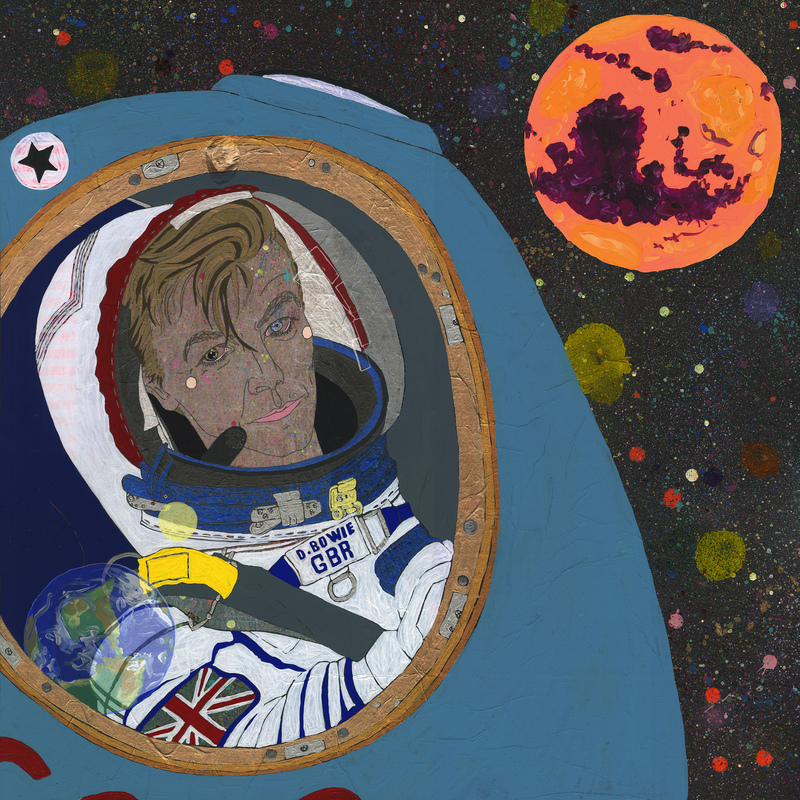 Last week, Tim Peake became the 1st British astronaut ever to walk in space. I borrowed his suit to portray Bowie. The reactions on social media pointed to our Major Tom headed up to Mars; I even read an article about a NASA conspiracy also involving Lemmy and Scott Weiland – so that’s exactly how I portrayed him, aged 69, in Tim Peake’s spacesuit, headed for Mars on the Russian Soyuz, looking back towards the moon and earth and bidding us farewell. 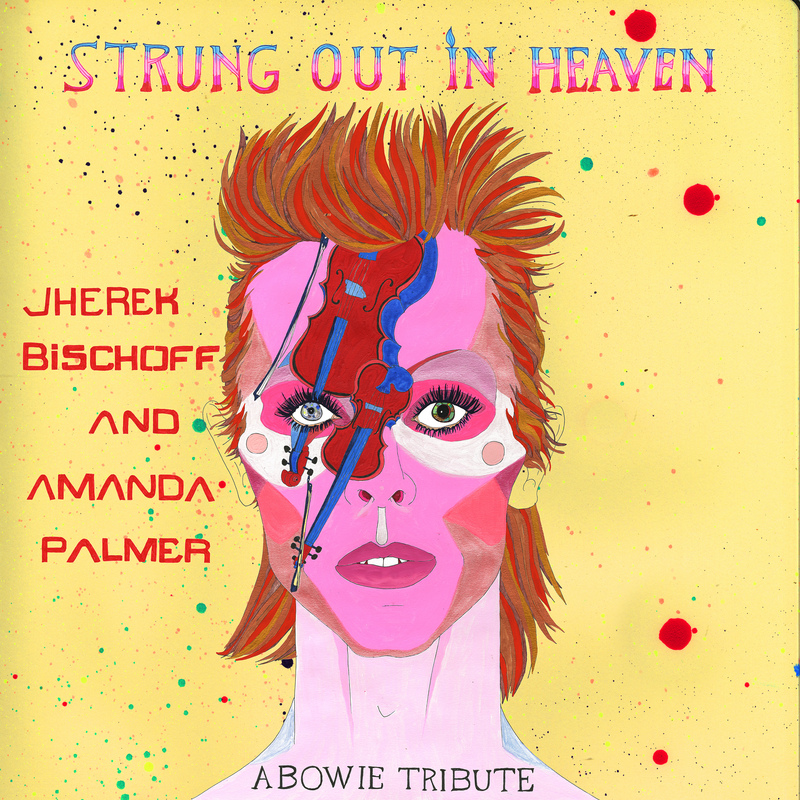 When Amanda told me she and Jherek planned to create Bowie covers entirely using stringed instruments, the first image that entered my head was the Aladdin Sane cover, with a violin and a cello in place of the lightning bolt. 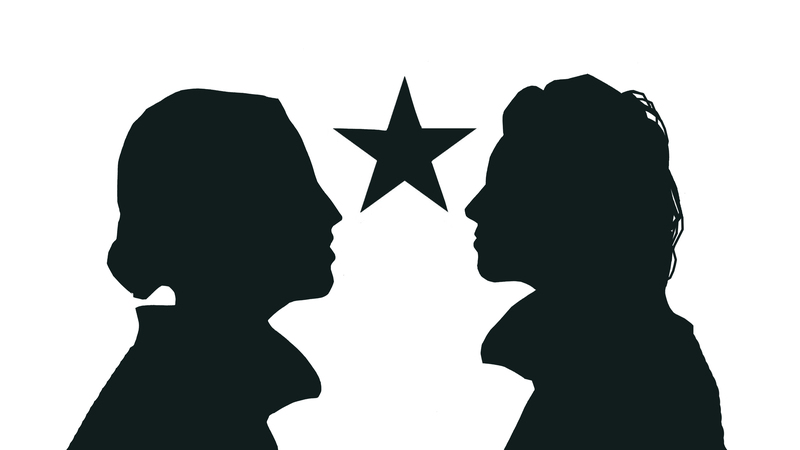 To me it is the iconic Bowie image – one which I would not wish to recreate without re-interpreting it in some way. (As I had done in an earlier piece about war involving a baby sporting the red and blue bolt and illustrated with the lyrics from 5 years). I’d considered changing the colours to actual wood tones – but ultimately decided on the striking importance of the red and blue. His two-tone eyes are of course the absolutest most perfect detail for an artist to portray. I woke up, saw my friend was still asleep, and quietly browsed my phone. Once I knew, I slowly got up and made myself breakfast, and watched everybody on my Twitter feed, especially the artists, mourn the loss. I didn’t want to tell my friend, but I was so glad that I would be the one to break the news once he woke up. When I was 15, I took the bus to high school with an mp3 player. Along with the Dresden Dolls songs and movie soundtracks and whatnot, there was the Ziggy Stardust album. I don’t even remember how I got into it, but that music was on loop through nine months of drawing classes. 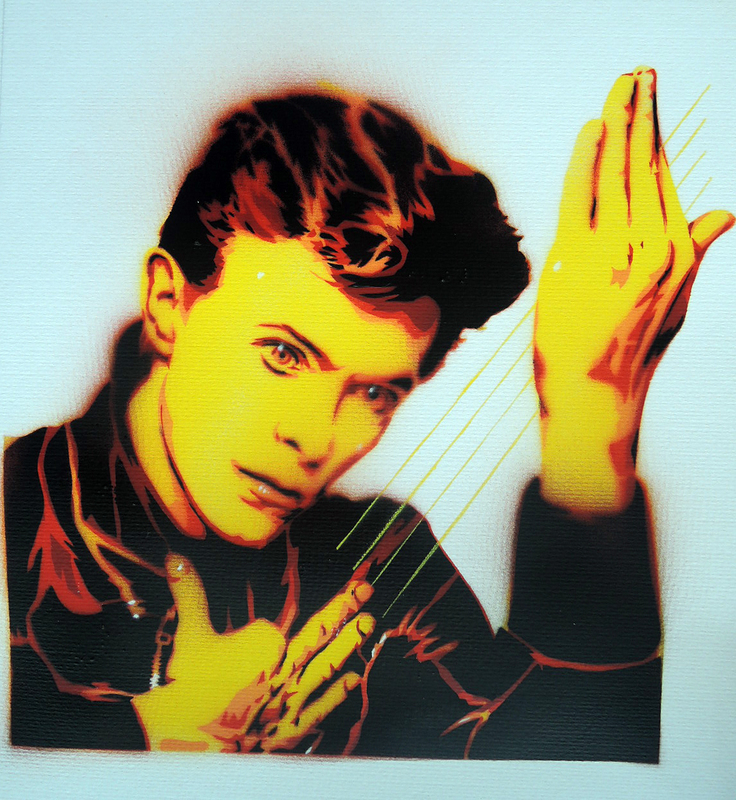 Bowie released 28 studio albums throughout his career. In all the years since high school, I have managed to listen to about twelve of them, and only properly know my way around eight or nine. Like the best music, it refuses to immediately lodge itself in your brain. It just doesn’t fit. It’s oblique, you need to look at it and figure out the angles. It requires your attention, and then it stretches you from the inside, like a growing fetus. You’re never quite the same afterwards. See, Bowie’s entire life was a powerful act of magic: by the time his body left us, his spirit had managed to possess all of us who welcomed it. As long as his work lives, the spell will never be broken, instead only finding more hearts and minds where the Bowie will be housed. Since the morning he died, every time I’ve tried to make music or conceive an image, he’s in there somewhere, his hand on my shoulder, whispering in my ear that I can strive for more, that I mustn’t lose sight of ant potential for the interesting, beautiful, extraordinary. Bowie won’t be releasing anything new anymore. So now we’re all a little more responsible, we all have to try a little bit harder. thank you to the whole team AFP for making this happen on breakneck schedule: especially eric, superkate, nick, alex, billh and courtney. love. LASTLY….I’d like to thank this man. I never would have done this project without his late-night, Bowie-greiving texting friendship.